I’ll admit that Taillevent is a very hard act to follow. Apparently, Alain Senderen, one of the other highly rated chefs in Paris, doesn’t it feel the necessity of trying. A day or so after the blissful lunch at Taillevent, I decided to try the slightly down-market, upstairs luncheon spot above his esteemed eponymous restaurant. 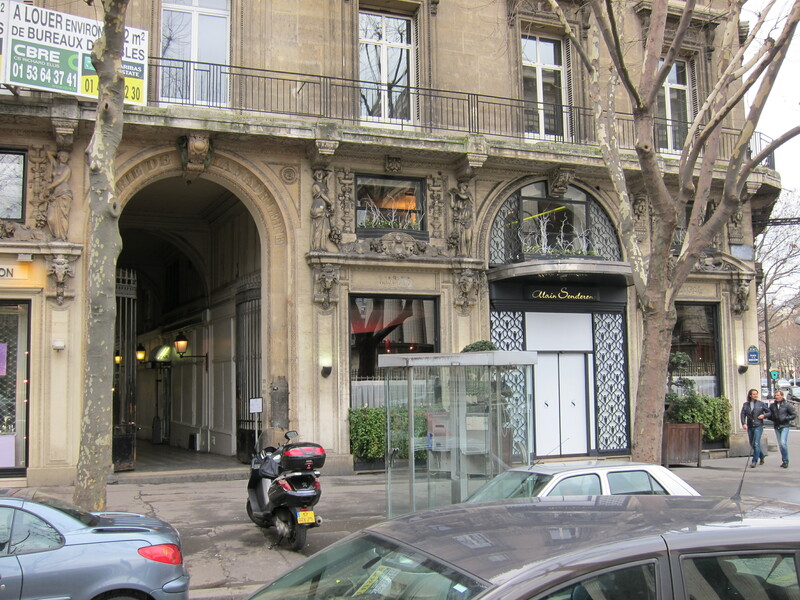 The entrance to Bar Le Passage is a few feet inside the rounded portal in the photo above. After lunch, I wondered whether Le Passage was where Senderen trained chefs and servers for service in the restaurant below. Or maybe he just doesn’t care all that much about the food and the service above. He figures people who come there are eating his name more than his food. I had two dishes for lunch. The first was a round, flat-topped mound of minced veal and crayfish tartare, mixed with a light and creamy mustard dressing, that sat next to a gummy wad of cellophane rice noodles dressed with lemon zest and chives. The second dish arrived in a shallow bowl. At first glance, it looked the bowl held nothing but cream froth. When the foam subsided, I saw millions of vanilla seeds in cream settling over a square thin sheet of pasta enveloping and tucked under large chunks of lobster and chiffonade of spinach. The pure flavors of cream, vanilla, lobster, and spinach didn’t exactly sound majestic chords of flavor but they communicated with each other in an interesting conversation. A hostess seated me in a lilac-hued room whose walls were decorated with stencilled tree branches. From the ceiling hung clear plastic squares with trees (if I remember correctly) etched on them. The decor was what you might expect in an Ikea cafeteria — modern and cheap. The service was indifferent. I saw another room where lunch parties were seated. Nothing I ate made me curious to experience the cooking below, although the dishes on the lunch menu are the same as in the restaurant, as far as I could tell. The servers did not make me want to put myself in their care again. Alain Senderen does not seem to care what is happening above his shop.